The Cambridge Gas Light Company was formed on March 15, 1852, as a result of a legislative act that was passed by the General Court of Massachusetts and signed by Massachusetts Governor George S. Boutwell. The act, which was largely prompted by the growing demand for gas service in Cambridge area, allowed for the company to manufacture and market natural gas to consumers. Although, initially, there was significant criticism from some Cambridge citizens about the potential dangers of gas lines, Charles C. Little, Isaac Livermore, and Gardiner G. Hubbard persisted in their efforts to supply the city with service. By January 17, 1853, the company’s first works were established at Bath Lane and Ash Streets and pipes were laid not only in Cambridge, but also, by April, into a portion of Somerville (Stone, 1930; Gilman, 1896). In 1871, the output of gas reached over fifty-seven million cubic feet per year (Gilman, 1896). On account of this significant growth, the company looked to establish a larger works elsewhere in Cambridge. By the early 1870s, the firm constructed a new plant in the Broad Canal area of East Cambridge. The proximity of these new production facilities to the canal enabled the company both to easily receive ocean shipped coal and to easily dispatch various byproducts from the manufacturing process (including coke, tar, and cinders) (Maycock, 1988). The capacity of the new plant at the time of its production was over one million feet per day. While, for a short period, the company operated both its original plant and the Broad Canal plant, the former works was abandoned by 1874. Gas consumption remained high for the company throughout the early 1870s; however, with the introduction of kerosene, sales dropped from eight four million feet in 1875 to fifty seven million feet in 1879 (Gilman, 1896). Despite this, over the next several years, the company continued to develop the East Cambridge site into an elaborate and extensive coal and gas works (Maycock, 1988). By the early twentieth century, the production facilities occupied approximately seventeen acres between First, Third, and Monroe Streets and the Broad Canal. At its height, the plant consumed about one hundred thousand tons of coal each year and had the capacity of producing and holding approximately 10,000,000 cubic feet of gas at any one time. By 1930, the firm employed 350 people, had a capital of over one million dollars, and was the largest taxpayer in the City of Cambridge (Stone, 1930). 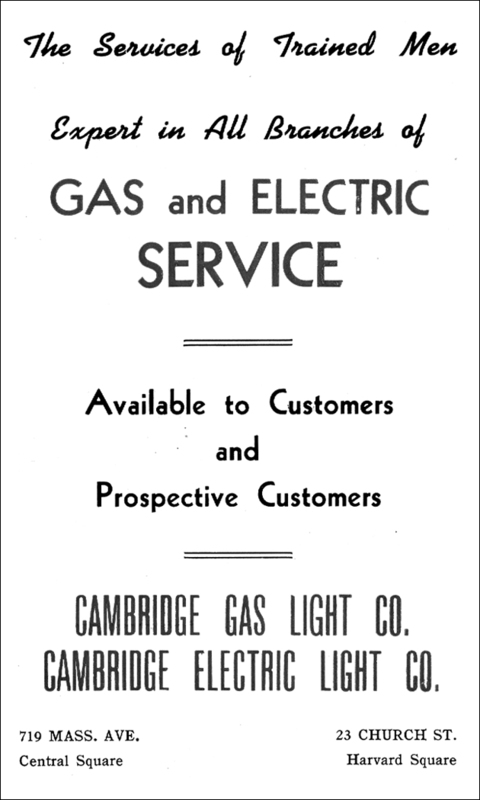 The Cambridge Gas Light Company continued production at its East Cambridge plant well into the twentieth century. By the early 1950s, however, the plant was permanently shut down and demolished due to the arrival of natural gas piped from Texas (Maycock, 1988).